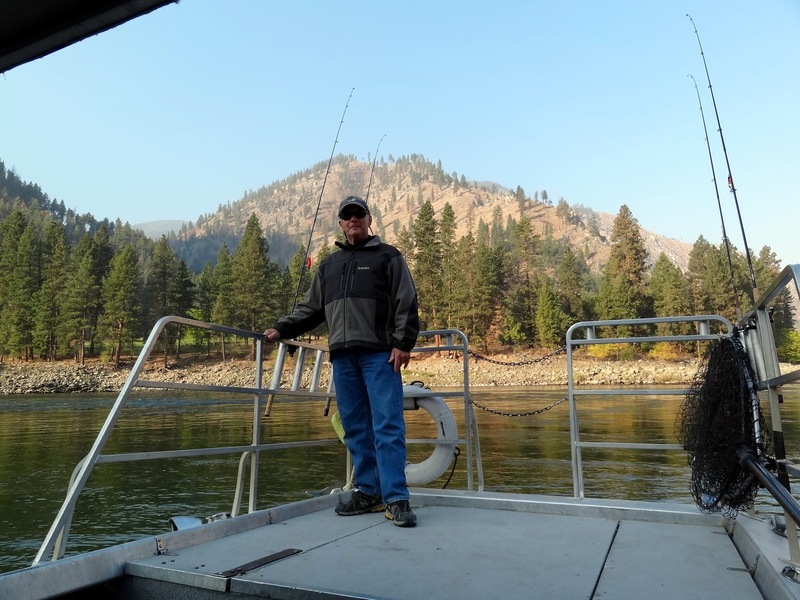 We are back from our Steelheading adventure in Idaho at Shepp Ranch. Once again, we were not disappointed. The weather was beautiful - clear and crisp. There was only a little smoke from the wildfires which mostly blew out of the canyon by mid afternoon. 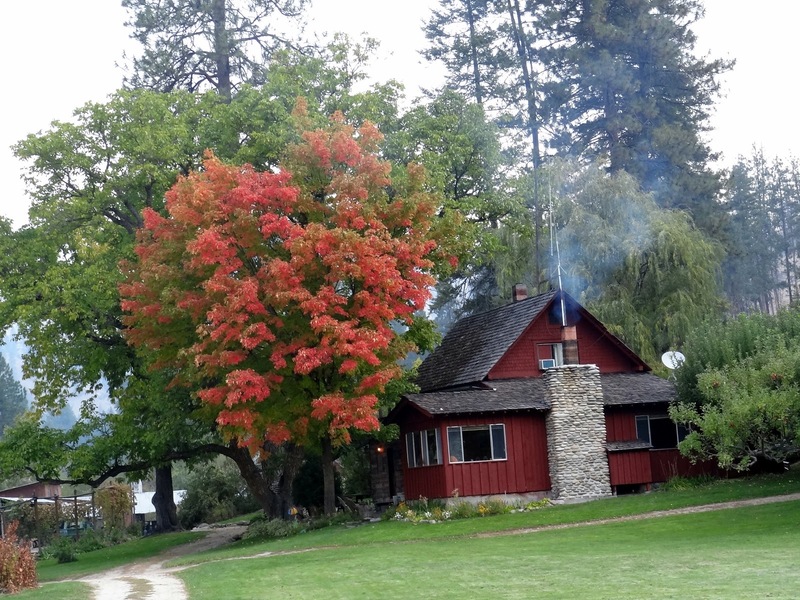 Here is how the ranch house looks in the fall. Gorgeous, don't you think? The sky isn't cloudy. What you see is smoke from wildfires, but it generally cleared up later in the day. 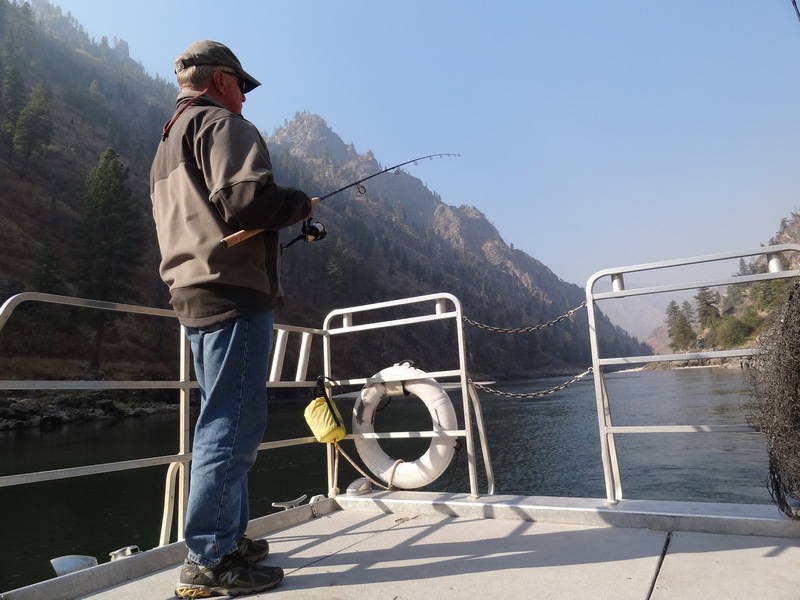 We spent our first day fishing for Cutthroat with our guide, Chuck, at the Confluence of two portions of the Salmon River. We caught a lot of very nice fish and had a wonderful day. I thought you might like to see Mr. Squash reel one in! I forgot to grab the belt to his waders so not only are they too big for him, he had to be careful and not get any water in them lest he commune with the fish! 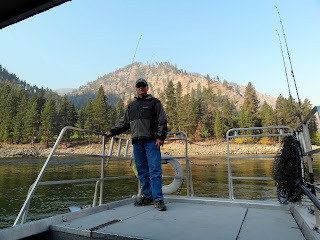 Day two we were ready and rarin' to go to try and land our first Steelhead ever! Mr. Squash is standing on the end of the jet boat. Behind him is the Polly Bemis Ranch - neighbors across the river. What a gorgeous day for fishing! You can just see the smoke at the far end of the canyon. Thankfully that fire was finally extinguished by the time we left. 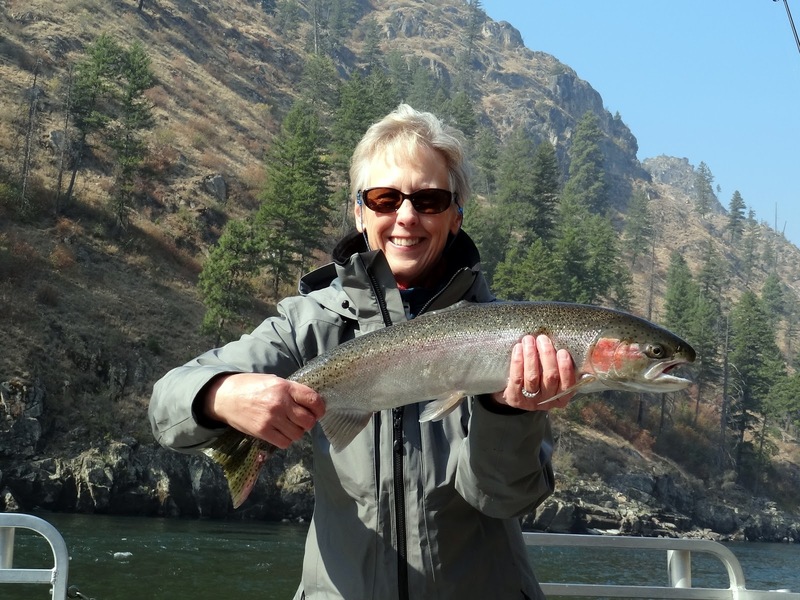 Here is my first Steelhead! 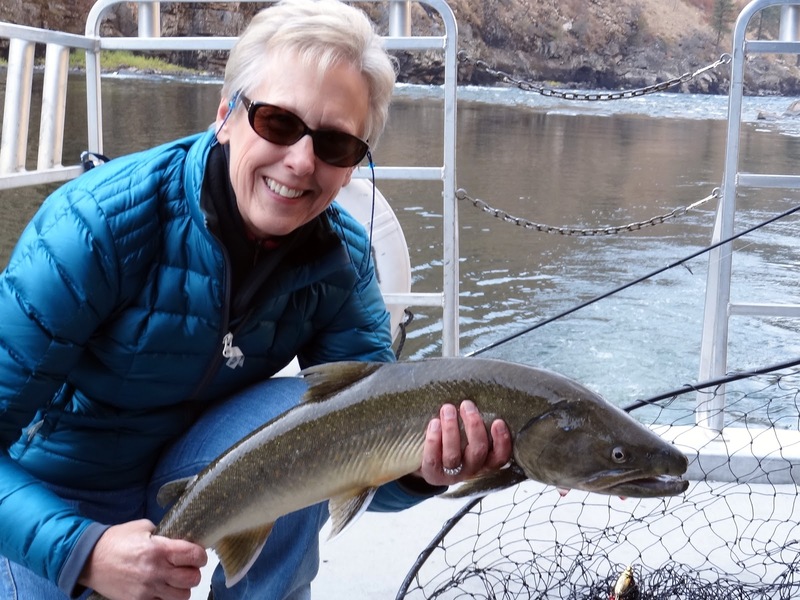 She was a hatchery female (they clip the adipose fins on hatchery fish) about 28 inches long and 5-6 pounds. Chuck gave us the option of putting her back or having her for Hors d’oeuvres. We chose the latter. 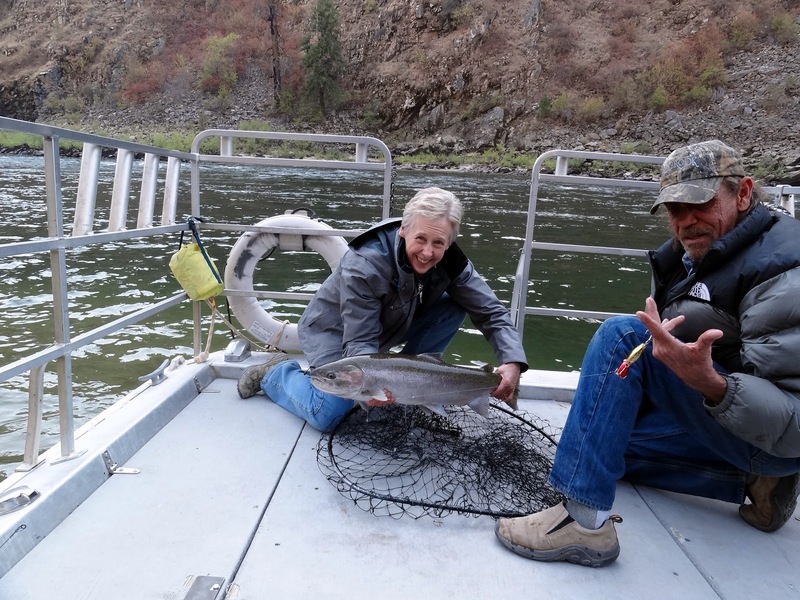 It was a lot of fun to reel in such a big fish. 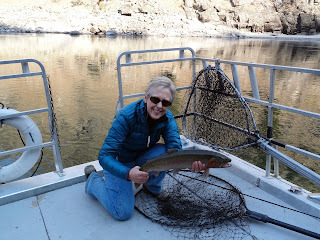 That day I caught another - a wild female. You are required to release all wild fish. She was a tad bigger and so beautiful! Chuck is holding out his finger because the lure went all the way through when he was unhooking the fish for me. We had to jet down to another ranch to borrow a heavy duty wire cutter to get it out! For Chuck this was like sticking yourself with a pin! What a guy! Here are the intrepid fishers and their guide warming themselves by the fire that evening! And here are the Hors d’oeuvres! Check out the quilt book! One of the ranch gals is a quilter! Oh, happy day! 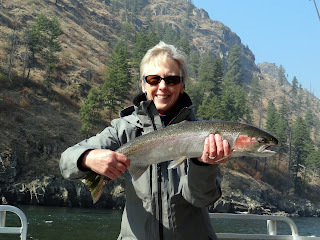 Jane brought several quilt books, fabric and her sewing machine to the ranch while she is there during Steelhead season! Now that's my kind of quilter! Jane has a blog, too! It's called Current Girlfriend. Here are the ranch gals. 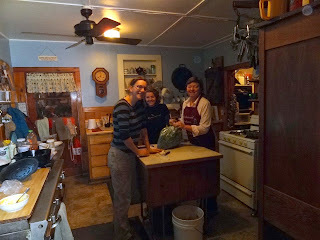 From left to right - Margie, the cook, Ellie and Jane. It was fun to have some "girl time" this trip! 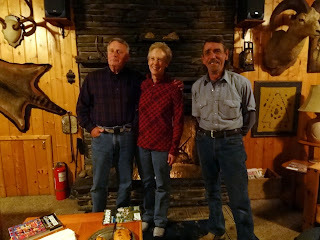 All three of them along with Lynn and Mike who manage the ranch and Chuck, our fishing guide took excellent care of us! 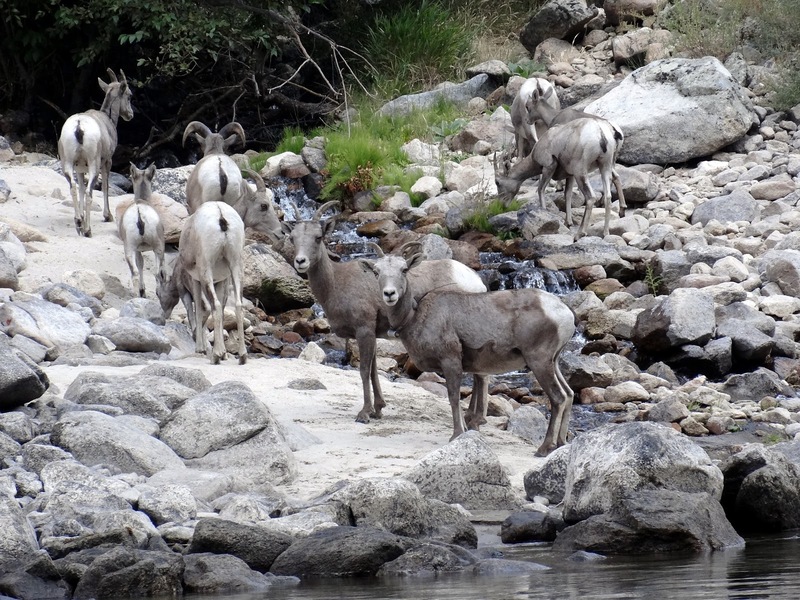 Here is a group of Bighorn sheep we came across on the river. This trip we saw several groups. They like to eat the lichen near the rocks and some of the grasses that grow along the river. 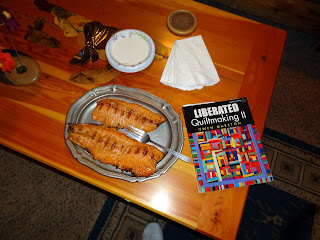 We also saw Chucker (birds), deer and fresh bear "evidence"! One of the neighbors up the river had 3 cougar in their yard one night! Here is a hatchery male I caught the last day. Another fun catch! Right after I caught the hatchery male, I hooked one that really put up a fight! I could barely turn the reel and it took much longer to bring it in. As it got close to the boat, I realized it wasn't a steelhead at all, but a Dolly Varden! They are endangered and must be released. Years ago Mr. Squash caught one in another river and now I know how much fun they are to catch! This beautiful male went back in the river! We had a great trip, but are always glad to come home to the Squash House! Such gorgeous scenery. 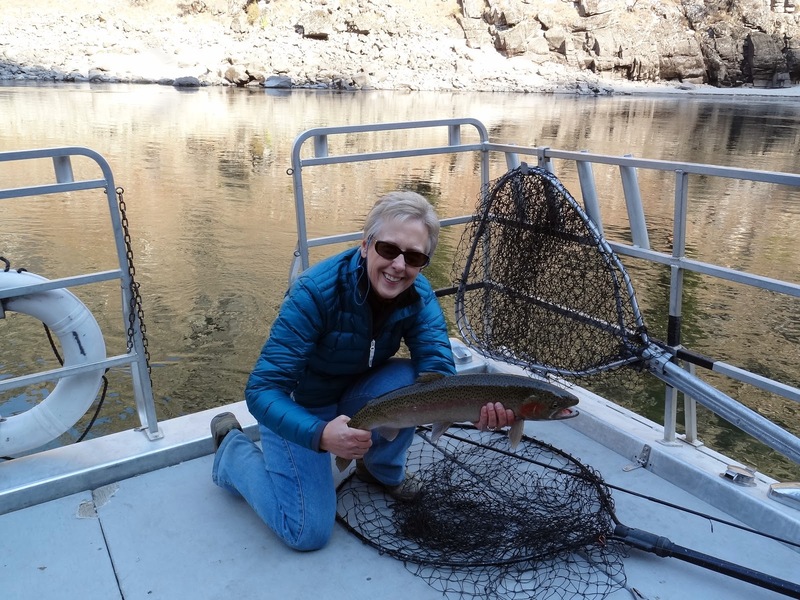 You look every bit the proud fisher woman! And how fun to find another quilter/fisher woman amongst you. Beautiful spot for fishing and enjoying fall! It was sew fun to hook up, Mrs. Squash! I signed up for the Sue Spargo workshop in McCall next spring after seeing your photo of the wool applique. We are kindred spirits! Wow, you are woman hear you roar! Sounds like a great time. Welcome home. Such beautiful scenery! Glad you had a great time and caught lots of fish. I am so glad you had a lovely trip . The views are beautiful and the day looks gorgeous too! What a lovely trip you had; such great catches and some girly energy too. those are some big fish. Poor Chuck!!! that hurts me looking at it. Glad you got some girlie quilt talk too. It must be quite a treat for Jane to have someone share her hobby. Candace, you have a great life. Those pictures are amazing.